Skipper... I don't think आप should slap Private when he's injured.... Private's face lol! xD. 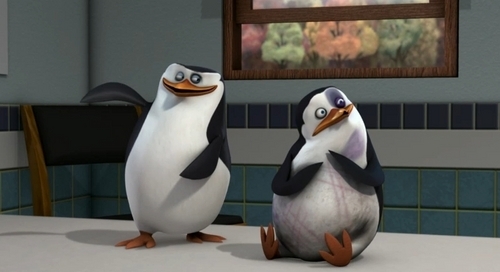 Wallpaper and background images in the पेंग्विन्स ऑफ मॅडगास्कर club tagged: penguins of madagascar picture penguin skipper private hurt injured slap. I'm kindof surprised that he's that badly injured. None of the penguins have ever shown as much as a black eye before (minus the bee stings in "Sting Operation"), and yet here Private is, covered from head to foot with scrapes and bruises, being slapped by his commanding officer. Wow, is Skipper a masochist now? Look at his face! "pulling your teeth out when your gums are sore"
-->I had that happen to me once. I bawling my eyes out from the pain & I'm not one who cries easily. Well, Private was attacked by the meanest dog you think of. I'm surprised he's still conscience. Poor Private. Skipper: *knocks me out* No one tries to arrest me! Bad Skipper! Bad bad Bad! I'm very disappointed in you!!! Skipper: But....Jenn! We had so much in common! Please don't go....Jenn? Jenn? Jennifer!!!! !